I’ve been wanting this discontinued China Glaze polish for the longest time and when I saw it on the ‘Bay, I had to jump on it! Unfortunately, my swatch is pretty darn naff but just look at the bottle to see the gorgeousness that exists within those glass walls. It’s like looking into a gilded nebula of awesomeness. Or something. I wore China Glaze Wagon Trail to destruction, literally. I’ve just spent 14 days at the inlaws and it was still on my fingernails 12 days into the trip – ok, it looked pretty horrendous on most of my fingers by that time but to give you an idea of longevity, the above photo was taken on day 4 of wear (with my usual top coat). It’s a two coater with a smooth, fluid consistency… a really great polish that I’m happy to cheat on my Spring/Summer shades with. Do you use Seche Vite? Is it worth it? I’m a terrible polish-smudger and I’m really hard on my nails so polishes generally don’t look good beyond 4 days. I love China Glaze, their formula is usually pretty good, they’re nicely inexpensive and they have an amazing shade range! This is one that I’ve had on my wishlist for a long time and for some reason when I ordered from H2T last time I passed it over for Atlantis. I’m kicking myself because it’s still high on my list to get! 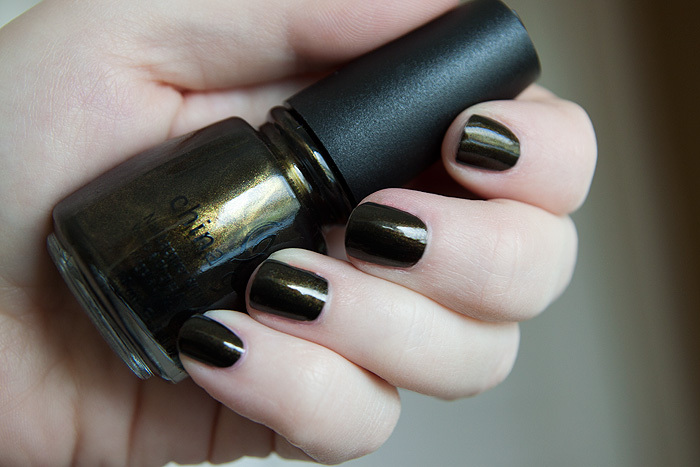 i am such a big fan of nail polish that is almost black like this one. Looks so glam, I def have to go try it out! Blackened greens are ZOMG, SO pretty.